Crafford, A.E.J., 2007, Geologic Map of Nevada: U.S. Geological Survey Data Series 249, 1 CD-ROM, 46 p., 1 plate [link to pamphlet/description accompanying the map]. 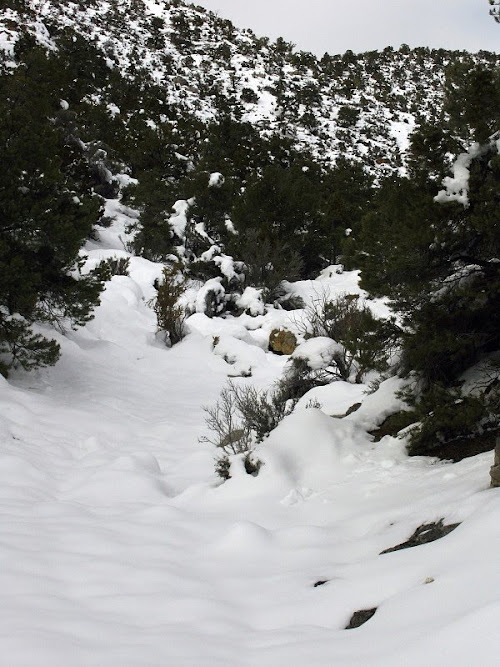 Dean, Nicole, Houston, Shauna, and Swanson, Karl, 2002, Geology of the White Pine Mts. 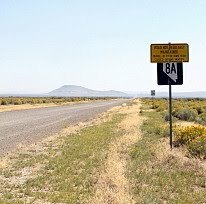 along Highway 50, eastern Nevada, 2001 Geology Field Camp: Geological Society of America Abstracts with Programs, v. 34, no. 6, page unknown. 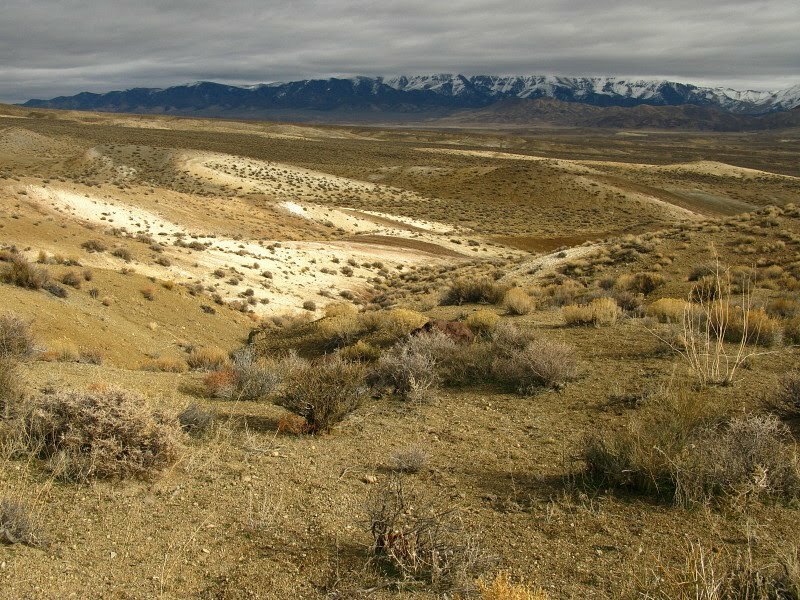 Dickinson, W.R., 2006, Geotectonic evolution of the Great Basin: Geosphere, v. 2, no. 7, p. 353–368; doi: 10.1130/GES00054.1. Dickinson, W.R., Saller, A.H., 1982, Alluvial to marine facies transition in the Antler overlap sequence, Pennsylvanian and Permian of north-central Nevada: Journal of Sedimentary Petrology, v. 52, no. 3, p. 925-940; doi: 10.1306/212F8094-2B24-11D7-8648000102C1865D [link to abstract]. Fagan, J.J., 1962, Carboniferous cherts, turbidites, and volcanic rocks in northern Independence Range, Nevada: Geological Society of America Bulletin, v. 73, p. 595-612; doi: 10.1130/0016-7606(1962) 73[595:CCTAVR] 2.0.CO;2 [link to abstract]. Keppie, J.D., Boyle, R.W., and Haynes, S.J., 1986, Turbidite-hosted gold deposits: Geological Association of Canada, Special Paper 32, 186 p.
Ludington, Steve, McKee, E.H., Cox, D.P., Moring, B.C., and Leonard, K.R., 1996, Pre-Tertiary geology of Nevada, Chapter 4 in Singer, D.A., ed., An analysis of Nevada's metal-bearing mineral resources: Nevada Bureau of Mines and Geology Open-File Report 96-2, p. 4.1-4.17, 1 sheet, scale 1:1,000,000. 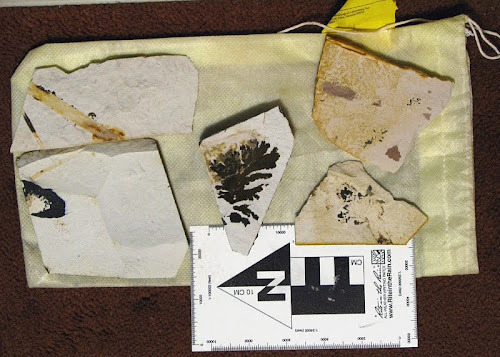 Mattinson, C.G., and Tiffney, B.H., 2001, Terrestrial plant fossils from the Mississippian Diamond Peak Formation, White Pine Range, eastern Nevada: PaleoBios, v. 21, no. 3., p. 1–11. Theodore, T.G., 2000, Geology of pluton-related gold mineralization at Battle Mountain, Nevada: Tucson, Arizona, Center for Mineral Resources, Monographs in Mineral Resources Sciences, 271 p [link to purchase]. 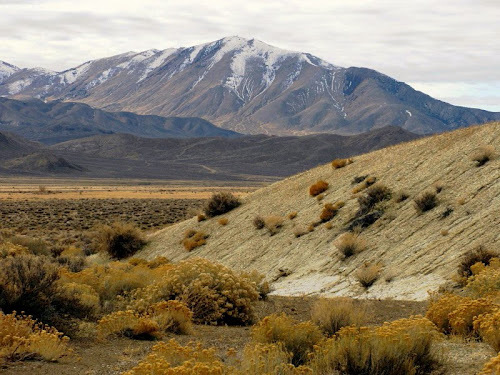 Watkins, Rodney, and Browne, Q.J., 1989, An Ordovician continental-margin sequence of turbidite and seamount deposits in the Roberts Mountains allochthon, Independence Range, Nevada: Geological Society of America Bulletin, v. 101, no. 5, p. 731-741; DOI: 10.1130/0016-7606(1989)101<0731:aocmso>2.3.CO;2 [link to abstract]. 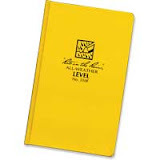 A geologist's field book is often a yellow or orange, bound or spiral book about 4⅝ by 7½ inches in size, with lined, columned, or gridded paper, often waterproof. 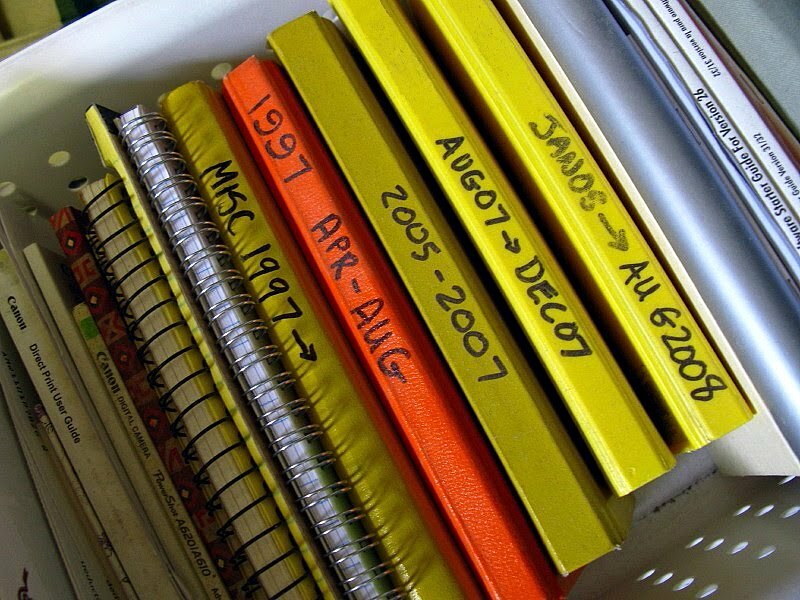 The first thing a geologist writes in his or her field book on any given day is the date. The second thing a geologist writes is the place — town, mountain range, mining property, reconnaissance target, township and range (or UTM coordinates if you are using an up-to-date coordinate system), country, county, river, sampling area, name of the field trip you are on — whatever is the most relevant and identifying locality title or place name for that current subsection of your notes. The third thing a geologist usually writes (at least if you were taught back in the 1970’s or earlier) is the day’s overall weather. Once upon a time, MOH and I left suddenly for an unexpected trip of unknown time duration, and I failed to empty all the coffee cups. Upon arriving back, having been gone most of 14 days, I tentatively looked in my cup expecting to find terrible mold, instead finding these lines of coffee deposited around the side of the cup. "Varves!" I exclaimed, "Except they aren't from yearly deposits, they're from daily deposits!" 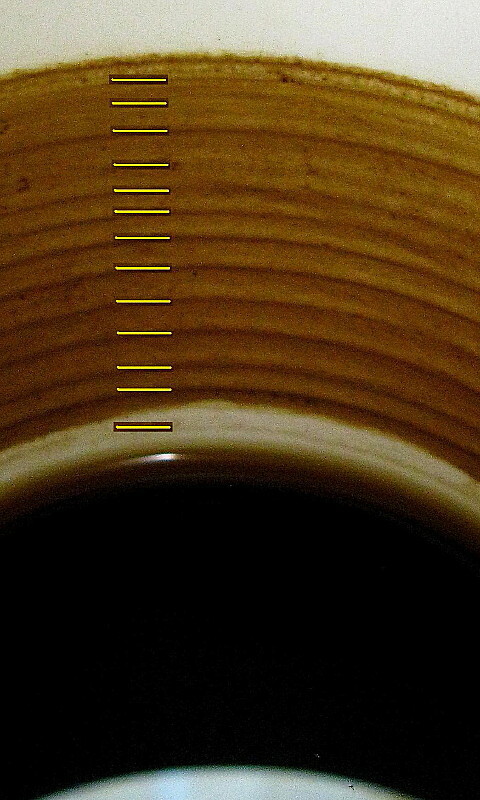 I've reflected a little, and asked a few close-at-hand sources, and decided these aren't really varves — and they probably aren't really rhythmites, either — for the simple reason that varves and rhythmites would be layers, of concentrated coffee in this case, that would have been deposited in the bottom of the cup. Instead, these must be more akin to strandlines — or shorelines around a coffee lake, in this case — as suggested by @GeoTheoBO. Other suggestions for what to call these deposits were Stratified Caffineite (@CGKings317), rhythmites (@alexbirtwisle), and my favorite, "Jarves" from "Java-varves" (@Dhunterauthor). Everyone else is welcome to jump into this discussion and naming exercise in the comments. 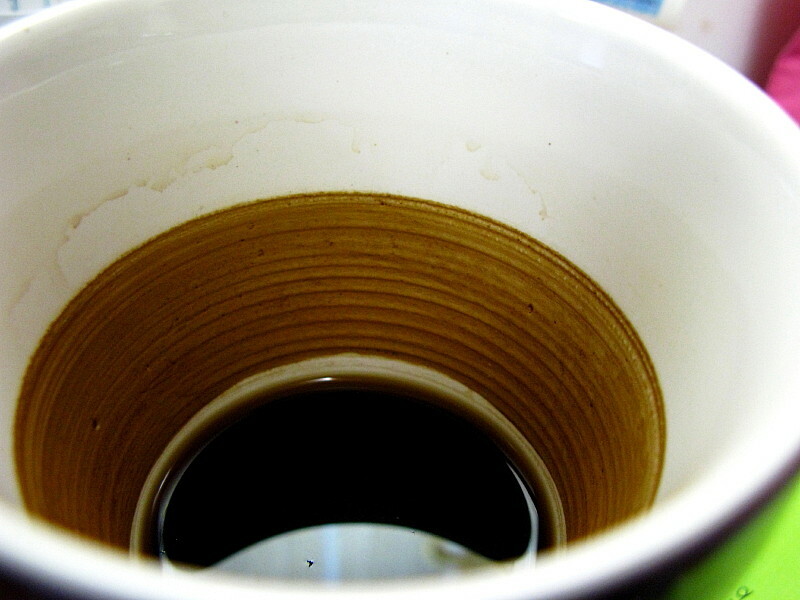 Prior to deciding that these were really the results of daily evaporation of coffee, I did count the rings. 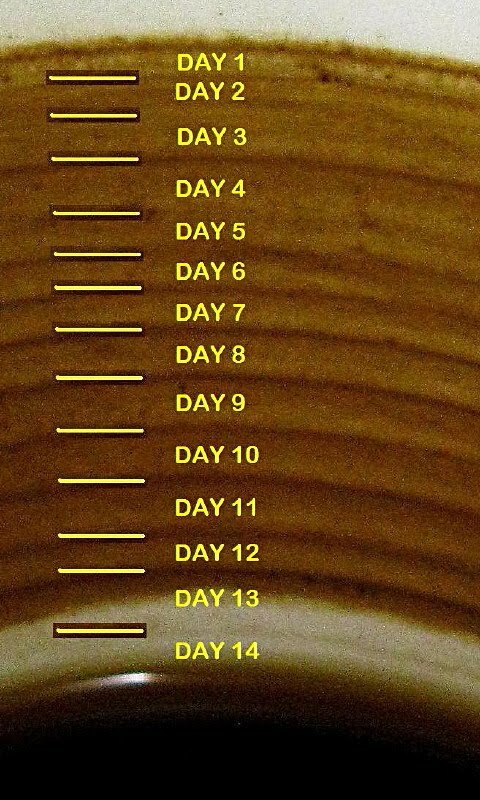 There are 13, with a possible incipient 14th one near the bottom representing the partial 14th day during which we arrived back in time to check the cup. The lines I've drawn above are based not just on the locally fuzzy record shown in that one photo, but on the three photos I took documenting the entire stratigraphic record around the entire inner part of the cup. Here are the final determinations. A few of the days are a little fuzzy and the lines have been brought in from the side, just like you might have to do when correlating deposits out in the field. Most day's deposits are light toward the bottom and darken upward, possibly reflecting something having to do with diurnal temperature and humidity variations. To be honest, I don't really know when the darkest portion of each day's ring forms, whether at night, during the day, or at some other time. The cup was sitting on the kitchen counter in the sunlight of the window the entire time we were gone; evaporation would presumably have been strongest during the daylight hours, possibly resulting in the lower, lighter colored part of the layer. Any other thoughts? This post has been submitted to the Bake-Sale Accretionary Wedge (AW#30), though no baking was involved. UPDATE: Accretionary Wedge #30: the Bake Sale is now up at Mountain Beltway. It's a very yummy Wedge, I might add. Definition: A fold in which the axial plane is horizontal. Definition: A fold in which the limbs are parallel. Definition: A sheath fold is a conical fold in which the conical surface is completely closed in the neighbourhood of the cone's apex. Alsop, G.I., and Holdsworth, R.E., 2002, The geometry and kinematics of sheath folds [abs]: Geological Society of America Abstracts with Programs, v. 34, no. 6, p.561. 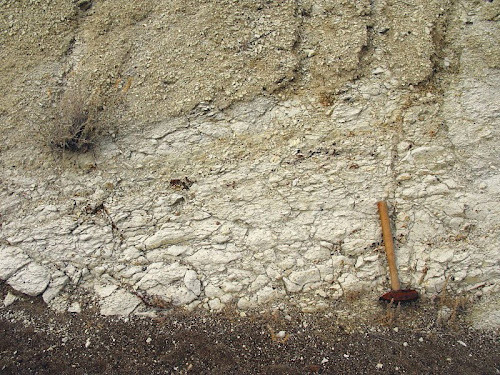 Alsop, G. I., Holdsworth, R. E., and McCaffrey, K.J.W., 2007, Scale invariant sheath folds in salt, sediments and shear zones: Journal of Structural Geology, 2007, v. 29, no. 10, p. 1585-1604; doi:10.1016/j.jsg.2007.07.012. Kuiper, Y.D., 2006 ,The usefulness of non-cylindrical (sheath) folds in monoclinic and triclinic shear zones [abs]: Geological Society of America Abstracts with Programs, v. 38, no. 7, p. 19. Moore, J., C., (unknown date), Shear Zones Ductile and Semi-brittle Zones of Distributed Deformation Around Faults, Especially Strike-slip Faults: "15ShearZones" page from University of California, Santa Cruz, Earth Sciences 150. Searle, M.P, and Alsop, G.I., 2007, Eye-to-eye with a mega–sheath fold: A case study from Wadi Mayh, northern Oman Mountains: Geology, v. 35, no. 11, p. 1043-1046; doi: 10.1130/G23884A.1. 1) Photo of sheath fold exposure (click "click here" for the diagrams). 2) How to make a sheath fold part 1 (then click "continue"). 3) How to make a sheath fold part 2 (click "example" to return to the photo). 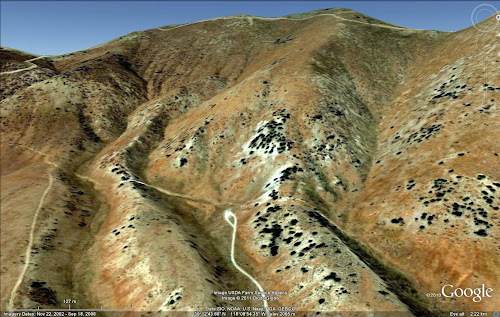 I captured this Google Earth image of the east face of Fairview Peak, with north to the right and the scale bar on the left showing 4112 feet, and then set about drawing the fault scarp created by the 1954 Fairview Peak–Dixie Valley earthquake. The location of the fault line (in magenta) is somewhat approximate in places, and I've left gaps where the trace is unclear. Identifying the fault line on Google Earth is complicated by the fact that two or more scarps occur in some areas. The line, as drawn, has not been field checked. An example of the scarp, as seen in an oblique Google Earth image. The scarp angles across the hill above the loop road near the center, and above the linear road to the left. Images below are broken into two halves and shown with north to the right (first two images), and then with north up (second two images). These images enlarge fairly well, with the horizontal (north=right) images being best in enlargement and the vertical images (north=up) being best on the blog. North half of the Fairview Peak strip with north to the right. South half of the Fairview Peak strip with north to the right. 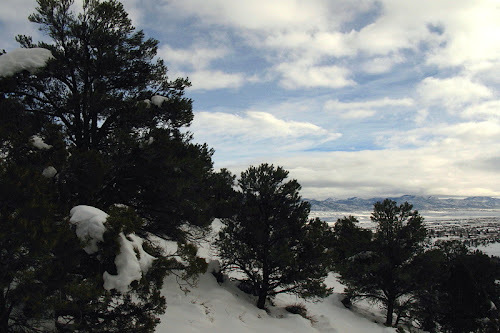 Two images: north and south half of the Fairview Peak strip with north up. Can't really say why I did this. I was just fascinated by the fact that you can take Google Earth, rotate the eye view to oblique and — especially after a visit to the area (early December) — can easily identify the fault scarp(s) in most places. Three years ago today, while driving the backroads north of Truckee, CA, I came across this old wigwam burner located in the small town of Sattley (Google Street View). These burners were used to burn sawmill and logging yard wastes until they were decommissioned during the 1970s to early 1980s — at the latest — due to both economic and environmental concerns (including the Clean Air Act of 1970). I remember seeing a lot of these burners while traveling in Oregon and California (especially Oregon) during my younger years, and so I associate them with my childhood. For some unknown reason, I have also come to associate the burners with the sickly smell of paper mills, even though sawmills and paper mills didn't (usually?) occur in the same locations. The stench of a paper mill — a strangely fond olfactory memory of sorts, because paper mills remind me of my grandparents' old house — is nearly indescribable: it is strong and penetrating, sharp to the nose, sometimes intolerably so if the wind is in the wrong direction or if the air is just hanging and not moving. I've heard some say that the thick smoke smells like rotten egg, a typical sulfur smell, which would make sense because one of the key ingredients of the output of paper mills is hydrogen sulfide, one of several TRS compounds (TRS = total reduced sulfur). In my memory, the smell is something stronger or sharper or sicklier than that of rotten eggs, and some have mentioned rotten cabbage or rotten broccoli (eew!). 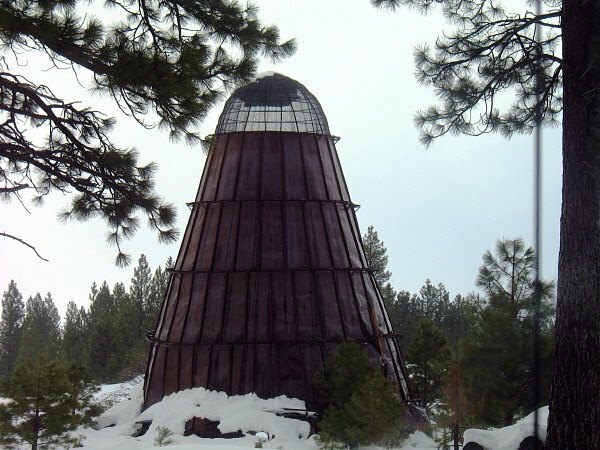 This compilation shows that zero sawmills are located in Oregon at present. List of remaining burners in the U.S. 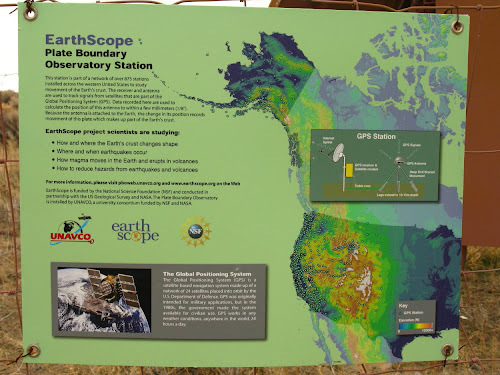 These selected field geology links from the geoblogosphere are listed roughly in chronological order, with a few related posts grouped together. There are numerous other posts about being in the field, doing field work, photos from the field, and reports on field trips scattered all over the geoblogosphere: don't get the idea that this list is by any means all inclusive! It was a gray, early December day, but we continued our exploration on backroads near Middlegate Station. 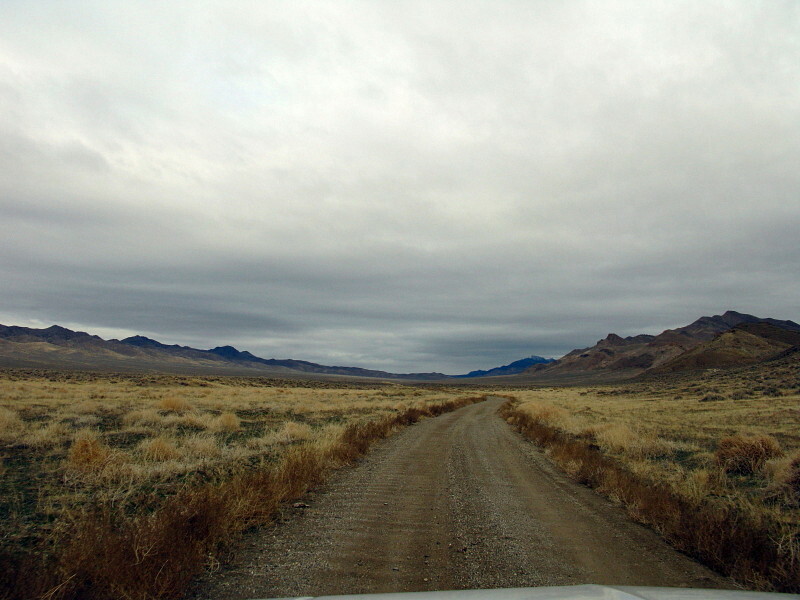 From the the exposures of flow-banded and brecciated rhyolite near Highway 50 — this was before The Shoe Tree had been cut down and could be used as an excellent landmark — we headed north on the main dirt road into the valley between the two southern branches of the Clan Alpine Mountains, the valley of Bench Creek. We took a sharp right at the first opportunity, within about a half mile of the pavement (the turn can be seen in the next-to-last picture of the previous post in this series). The side road took us up the main wash, where we were tasked with looking for "little white flakes" of the middle Miocene Middlegate Formation, a formation composed of coarse- to fine-grained, often tuffaceous, sometimes zeolitized lacustrine sediments with interbeds of tuff, all lying unconformably on the older volcanic rocks of the Clan Alpine and Desatoya Mountains. A short distance up the wash road, we came to this exposure of white rocks... and though the weathering pattern looked blocky rather than flaky to me, we stopped to check it out. Darn, we'd pulled over for a poorly welded lithic-rich ash-flow tuff, no doubt older than the rocks we were looking for. We moved on quickly, continuing up the wash. Following the main wash road as we had been instructed by a hand-drawn map given to us at Middlegate Station, we finally came to a saddle overlooking this sedimentary section. These are the same tuffaceous sediments that can be seen north of Highway 50 when driving between Cold Springs and Middlegate gap, where the Shoe Tree used to live. 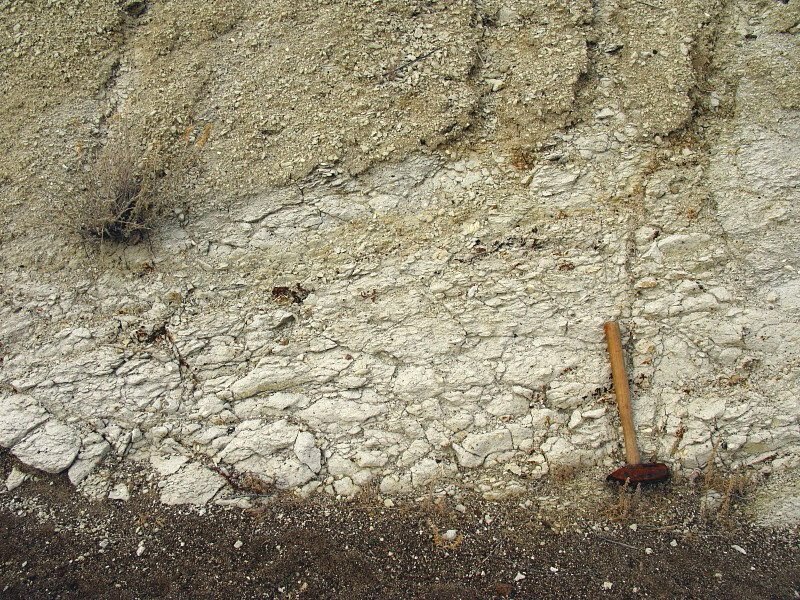 The sediments were deposited in a small Miocene basin known as Middlegate Basin. 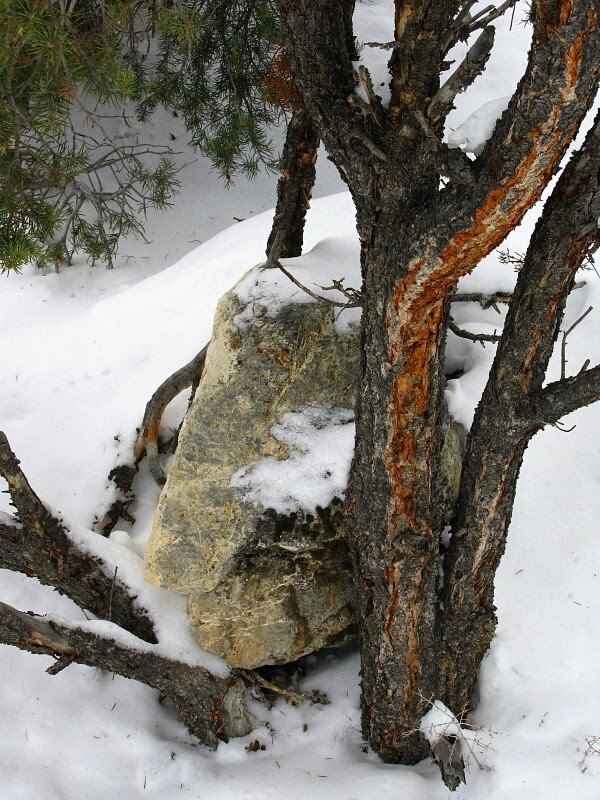 Leaf fossils and petrified wood are reported in these rocks, and the zeolite erionite has been mined, at least in a small way, near the junction of S.R. 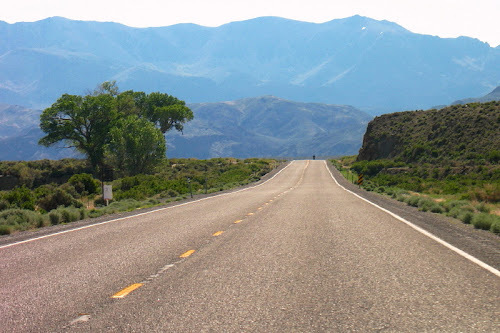 722 (old Highway 50, former Route 2) and Highway 50. 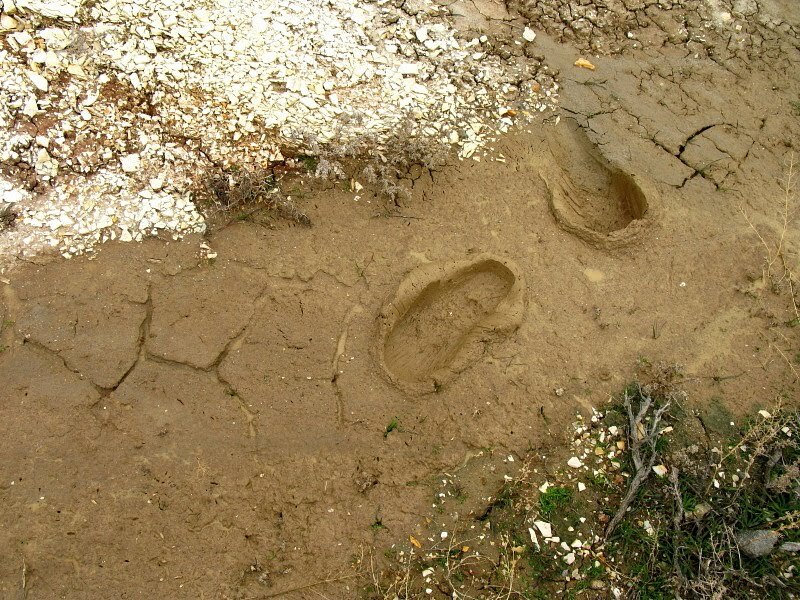 We trekked over to the white patches we could see from the saddle, and wandered around the overly muddy area looking for leaf fossils, breaking open numerous small slabs of white tuffaceous shale. We were unsuccessful for some time, and that's because we were in the wrong place. Close, but not quite. Part of the Eastgate 1:24,000 topo map via MSRMaps courtesy USGS; X marks the saddle, not the fossil locations; sections are a mile on each side. The saddle roads form a crude X in the center of this Google Earth image. In order to find the fossils, you should not stop at the saddle (we had turned left and had parked on the narrow muddy ridge northwest of the saddle) but should instead keep driving down a fairly steep over-the-saddle road to the ENE; then, near the bottom of the hill, you should turn and drive southeast down another wash to a main wash heading SSE to south. In fact, while wandering around before driving over to the one fossil site we found, we could see a small hill with small diggings. 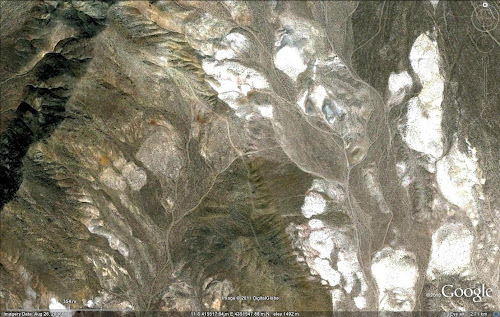 That hill, located near the bottom of the GE image, is where we found the fossils. It looked like the area had been pretty well picked over — we banged around quite a bit and only took these meager specimens. I suspect there are better localities, possibly shown here. I haven't the vaguest idea which of the many possible Middlegate flora leaf types (or stems, seeds) are represented by our bits and pieces. See these three lists (from Table 1 in Axlerod, 1985). 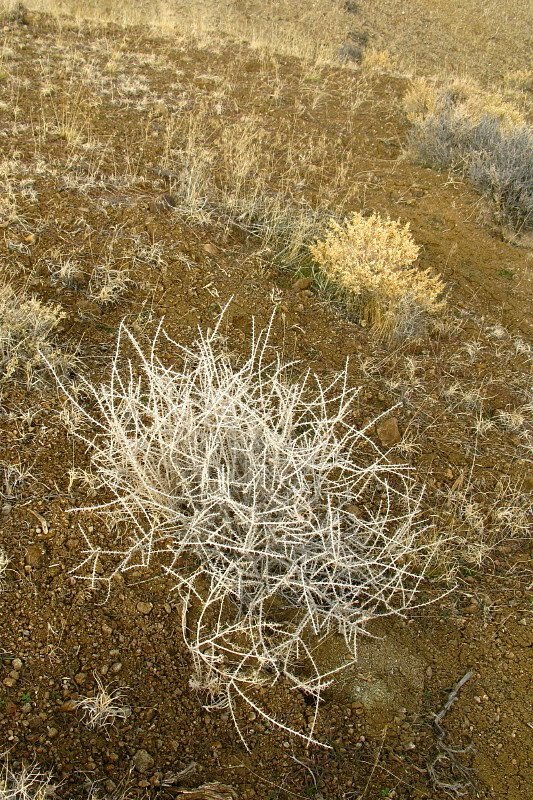 This plant growing near the saddle caught our eye as an unusual bush, then after our eyes became attuned to it, we saw it everywhere. After fossil hunting, we tried to exit southward out of the wash. It was ultimately too muddy, and I don't think it's easy to find an Eastgate Wash crossing without a good map or current air photo. So we drove back to the saddle, up the steep road, and back down to the main wash road. 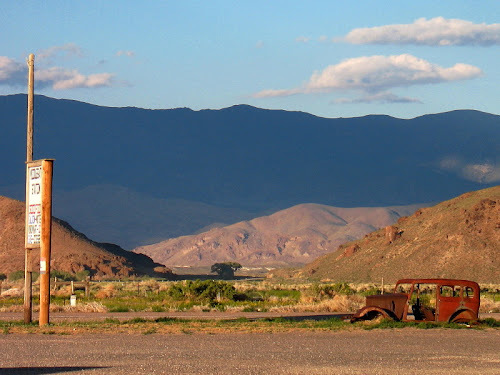 After trying for some unknown reason to drive south toward The Shoe Tree, and then stopping just barely in time before entering an impassable field of mud, we drove back to the main wash road and saw a fence on a little hill. We drove up to it and found this EarthScope installation. 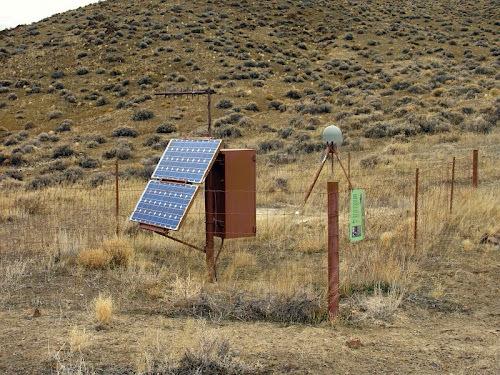 This particular EarthScope observatory, is one of several plate boundary observatories strung across central Nevada near Highway 50. 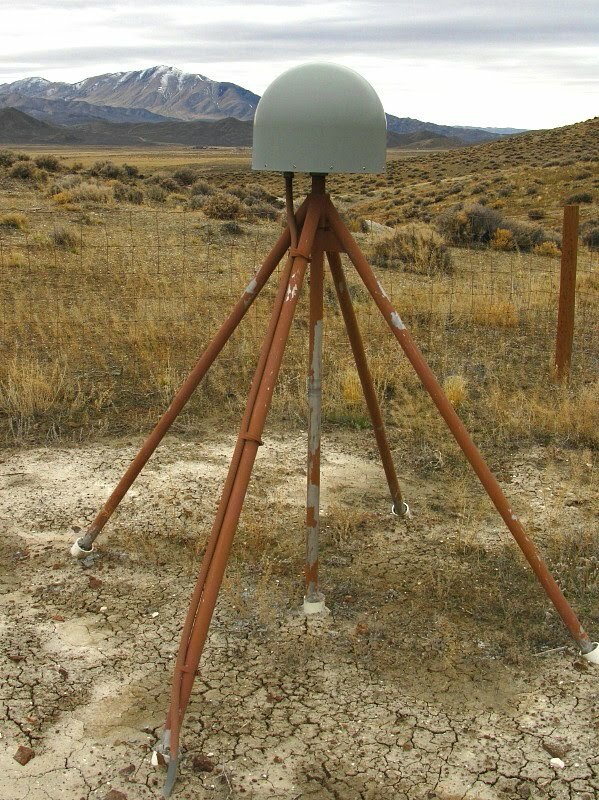 This is Station P068's GPS receiver, with Fairview Peak in the background. As we leave the wash, near our first tuff stop, Fairview Peak looms in the distance. Axlerod, D.I., 1956, Mio-Pliocene floras from west-central Nevada: University of California Press, 54 pp. Axlerod, D.I., 1957, Late Tertiary floras and the Sierra Nevada uplift: Geological Society of America Bulletin, vol. 68, p. 19-46 [abstract]. Axlerod, D.I., 1985, Miocene floras from the Middlegate Basin, west-central Nevada: University of California Press, 279 pp. Barrows, K.J., 1980, Zeolitization of Miocene volcaniclastic rocks, southern Desatoya Mountains, Nevada: Geological Society of America Bulletin, v. 91, no. 4, p. 199-210 [abstract]. Burke, D.B., and McKee, E.H., 1979, Mid-Cenozoic volcano-tectonic troughs in central Nevada: Geological Society of America Bulletin, v. 90; no. 2, p. 181-184 [abstract]. Eakin, T.E., 1962, Ground-water appraisal of Gabbs Valley, Mineral and Nye Counties, Nevada: Nevada Department of Conservation and Natural Resources, in Ground-water Resources - Reconnaissance Series Report 9, 54 pp. Papke, K.G., 1972, Erionite and other associated zeolites in Nevada: Nevada Bureau of Mines and Geology, Bulletin 79, 36 pp [link to purchase]. Spock: Admiral, if we go "by the book," like Lieutenant Saavik, hours could seem like days. Kirk: I read you captain. Let's have it. Spock: The situation is grave, Admiral. We won't have main power for six "days." Auxiliary power has temporarily failed. Restoration may be possible, in two "days." By the book, Admiral. Kirk: Meaning you can't even beam us back? Kirk: Captain Spock, if you don't hear from us within one hour, your orders are to restore what power you can, take the Enterprise to the nearest star base, and alert Starfleet Command as soon as you're out of jamming range. Commander Nyota Uhura: Sir, we won't leave you behind! Kirk: Uhura, if you don't hear from us, there won't be anybody behind. Kirk out. Kirk: Regulation 46-A: "If transmissions are being monitored during battle..."
Saavik: "...no un-coded messages on an open channel." (to Mr. Spock) You lied. Kirk: Hours instead of days. Now, we have minutes instead of hours. Last year I posted about Hat Creek in northern California, and in the process of creating the post, I came up with a number of links about hydraulic jumps. I was trying to teach myself a little about hydrology, which was not something taught in any class offered while I was in school many years ago (except for Ground Water Hydrology, which didn't get into the surface water or surface flow aspects of ground water very much). I became confused reading about hydraulic jumps online, about how the water level increases where the flow changes from supercritical to subcritical (in a downstream direction), with whitewater or rapids being examples of hydraulic jumps. My confusion came because in my pictures of Hat Creek, the water level starts off higher, then drops into the rapids after flowing over some logs. What I failed to realize until things were clarified for me by Anne Jefferson at Highly Allochthonous, was that my Hat Creek photos show a *small* hydraulic jump, and that the water level rises in the whitewater itself, nevermind the drop it makes over the log jam. Rather than trying to explain hydraulic jumps further myself, I'm simply going to provide some links for those of you that want to learn more. A new hypothesis (1997) Gordon E. Grant: Water Resources Research - A 1.2 MB pdf, possibly not that new anymore? Hydraulic model study of a canoe chute for low-head dams in Illinois (1999) Marjorie E. Caisley, Fabian A. Bombardelli, and Marcelo H. Garcia: Illinois Department of Natural Resources - A 6.0 MB pdf, long and somewhat technical. Hydraulic Jumps: Bubbles and Bores (2007) H. Chanson: 16th Australasian Fluid Mechanics Conference, Crown Plaza, Gold Coast, Australia - Technical, with good examples of tidal bores. "The hydraulic jump is the sudden transition from a high-velocity open channel flow regime to a subcritical flow motion." Open Channel Flow Basics - Hydraulic Jump Calculations (2010) Harlan Bengtson: Bright Hub - Some basics with calculations. "A hydraulic jump occurs wherever a supercritical flow is taking place in a channel that doesn't have a slope steep enough to maintain the supercritical flow." Hydraulic Jump (2003) Cathy Hartner, Shelly Davis, and Michon Hale - basics and some calculations (possibly a student paper?). 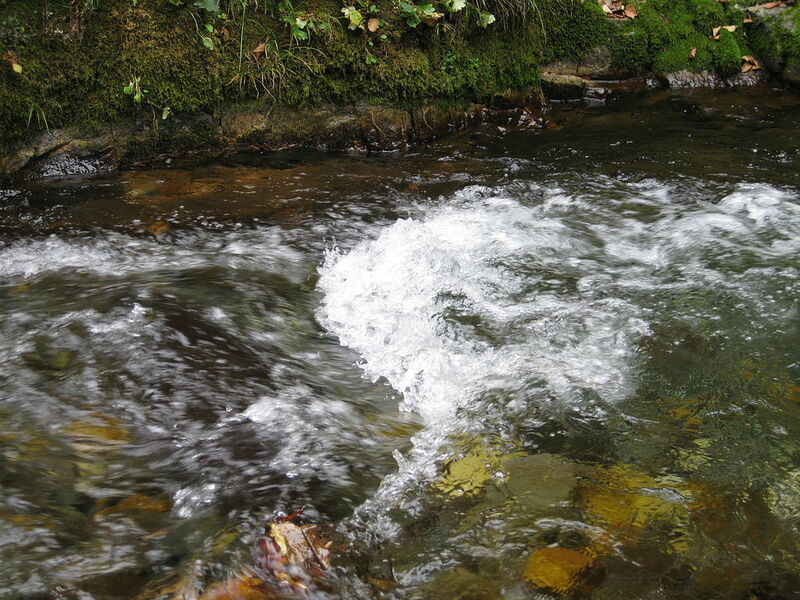 "A hydraulic jump is a sudden rise in water level due to decreasing velocity." Hydraulic Jumps I: 1-Layer Flow by Bruce R. Sutherland: University of Alberta - pictures of hydraulic jumps. Surface Tension and the Hydraulic Jump by John W. M. Bush: MIT - More pictures! Hydraulics over a weir by Little River Research and Design - A great video showing a hydraulic jump. Underwater view of turbulence and fish by Little River Research and Design - An underwater video, I didn't see the fish, just the rocks. UPDATE: See first comment and additional video below. Smallmouth bass and dusky shiners in high velocity closeup - Also by Little River Research and Design - this is the one with the fish in it! This winter (and late fall) we've had very cold temps, then a lot of snow, then even more snow, and then more cold temps, with one warmish week in early December. 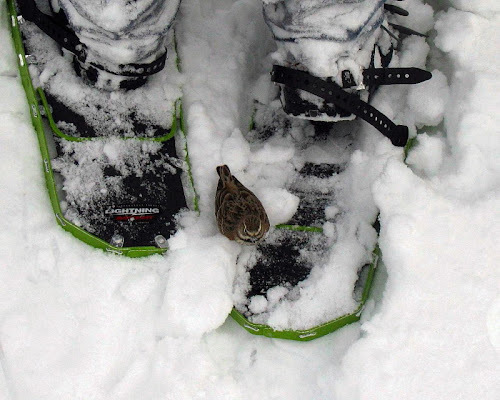 We finally stopped shoveling one mostly gray day last week and went snowshoeing in the canyon above our little house. 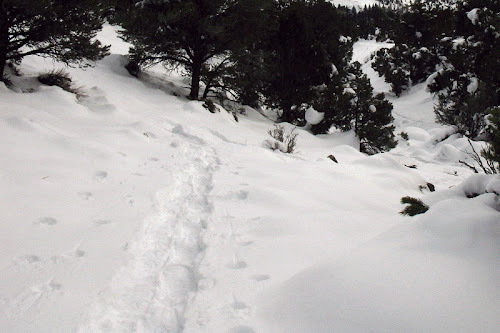 Getting there wasn't as interesting as being there, looking upward at the untracked snow, and then tracking into it. 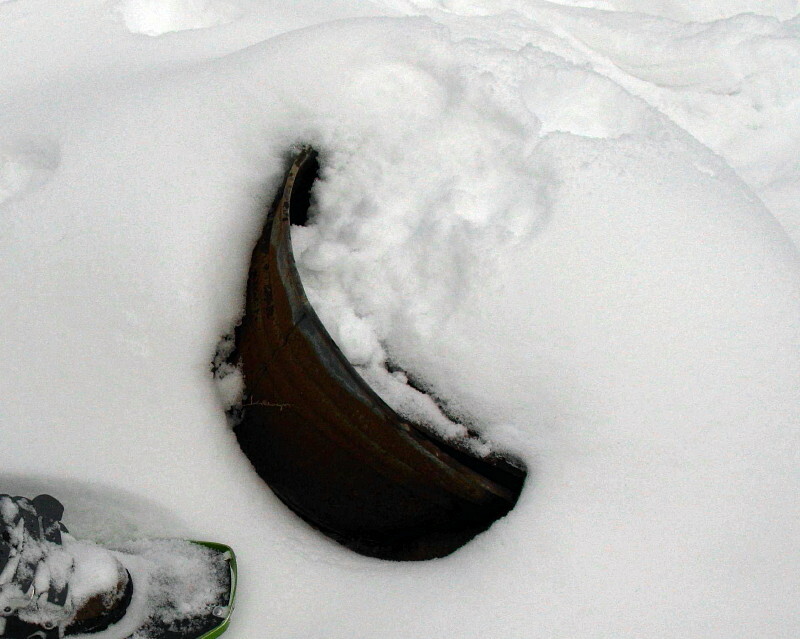 Here's an old, rusty tub or pot of some sort we found buried in the snow, with snowshoe for scale. 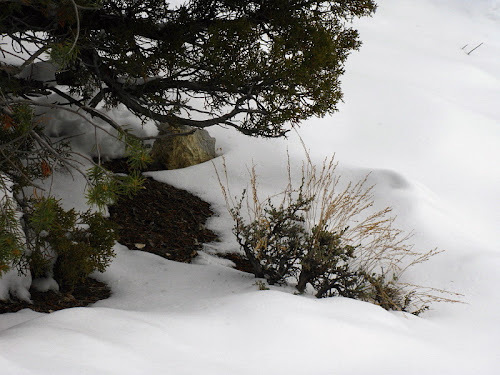 The canyon had little icicle-covered ledges and beds of limestone or dolomite sticking out here and there, and although they weren't terribly photogenic this juniper with boulder was. How and when did the boulder get into the tree? Hard to tell with the snow cover. Ah, peaceful snow scene with sagebrush, hidden rock, and needle-covered soil under juniper and nearby piñon. ...including the distant, sunlit alluvial fans of the Duck Creek Range. About then, we looked at our back trail and started down. 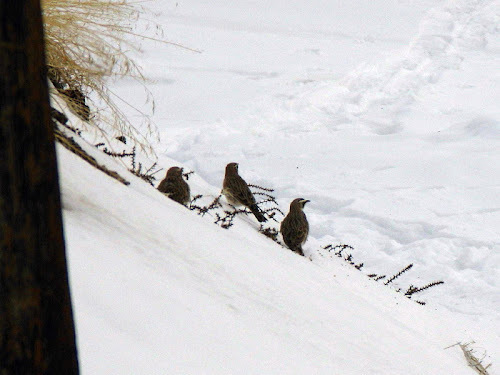 Close to our ending (and beginning) spot, we came to a gate we go through, and MOH ahead of me spotted these birds pecking at seeds on the ground. I grabbed the camera out of my vest pocket and started trying to get some pix, mostly for identification purposes. I leaned around MOH, as inconspicuous as possible, shooting between the horizontal railings of the wooden gate. The birds were alert and watching, and I thought they were antsy because of our presence. Suddenly, they all flew away from us, to the left - except for one bird that flew to the right. We had scared them off! 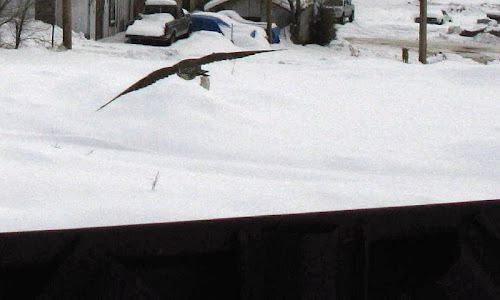 Before I could turn the camera off, a hawk was swooping in low toward the one lone bird, and toward us, finally coming to an air stop with it's wings right over our heads. I shot pics as fast as possible, barely aiming, and got this one picture of it flying away, unsuccessful at trying to have lunch. The little bird had hidden from the hawk by landing on the back of MOH's snowshoe, right in front of me! The little birds are Horned Larks. Some had distinctive yellow under the chin, and you can (barely) see the "horns" in the pictures. Couldn't get an ID on the hawk, which had scared the birds away - we weren't the culprits! 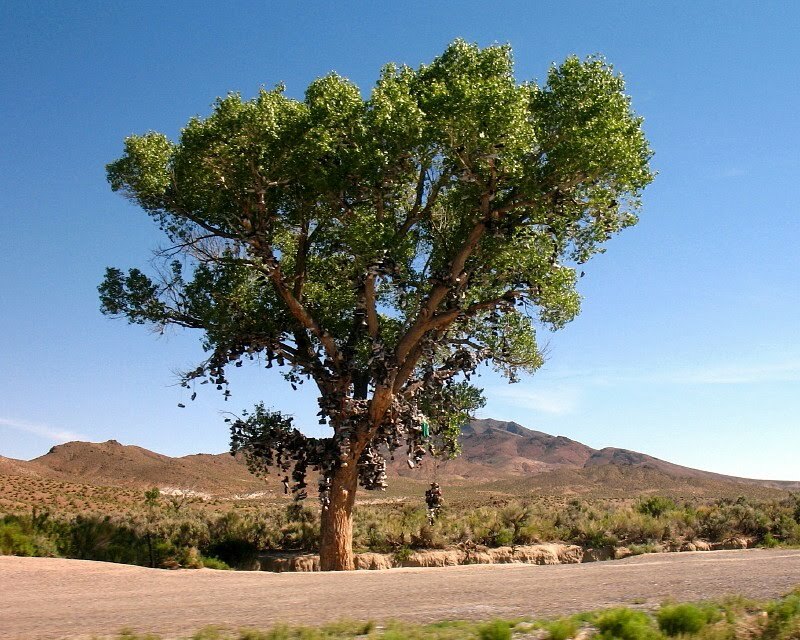 Word has it [and now we know it's true] that The Shoe Tree on Highway 50 (Google Street View) in central Nevada at Middlegate (MSRMaps), just east of Middlegate Station (MSRMaps), has been cut down, as reported here and here. The second link [now archived and not viewable without logging in] shows two pictures of the downed tree, with the tree's stump still firmly planted in Eastgate Wash, where the large cottonwood tree had been growing for many, many years. 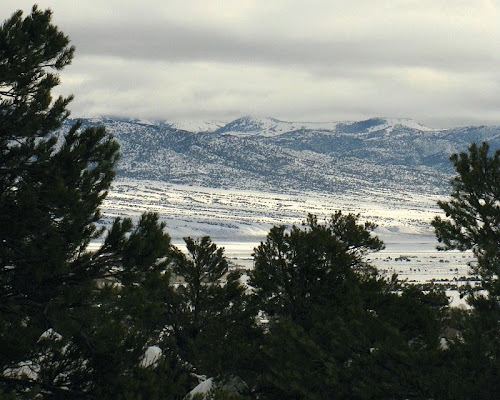 One of the two photos clearly shows the snowy Desatoya Mountains in the background, along with a bit of the eastern hills of the Clan Alpine Mountains. Thanks to @NevadaWolf for spotting this. UPDATE 3Jan11 9:54 am: Another picture of the cut tree can be seen here. Timing has been tentatively narrowed down by two sources to December 30th (from Shoefiti and the Austin Nevada Facebook page ). The first mention of this sad deed on Twitter was on the afternoon of the 31st. 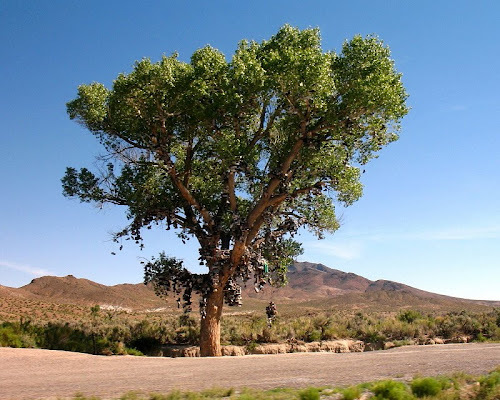 People often want to know the origin of The Shoe Tree. It apparently dates back about 25 years to the early or mid-1980's, according to this New York Times article. Middlegate (the notch through the eastern part of the Clan Alpine Mountains) will never look the same. Neither will the view from Middlegate Station. I took these photos of The Shoe Tree in early June, 2008. You can see more photos of the Shoe Tree here (with a few other trees). I'll update when more information comes in; so far I haven't seen anything on any news site. UPDATE 6Jan2011: I'm placing most of the identical AP-related stories below and won't be adding to those further. You can find them on Google. NOTE: Fredda Stevenson's name is misspelled in some early AP-related stories. //UPDATE: corrections have been made to some articles. For having, in the natural history of this earth, seen a succession of worlds, we may conclude that there is a system in nature; in like manner as, from seeing revolutions of the planets, it is concluded, that there is a system by which they are intended to continue those revolutions. But if the succession of worlds is established in the system of nature, it is in vain to look for anything higher in the origin of the earth. The result, therefore, of this physical enquiry is, that we find no vestige of a beginning,—no prospect of an end. John McPhee took us a little deeper in 1981, when he introduced the phrase "deep time" as a proxy for geologic time in his book Basin and Range. Prior to that, geologic time was the realm of geologists; since then, deep time has become a part of our everyday vocabulary. John McPhee, in essence, gave geologic time to non-geologists. As a geologist, I've studied geologic time at least since high school, when I took Earth Science as an elective, extra science. I knew of geologic time prior to that, going back possibly into my early or middle childhood, when I became fascinated with rocks, minerals, volcanoes, trilobites, and dinosaurs, and when I probably learned some of the names of the geologic time periods and eras, such as Cretaceous. (Wikipedia shows the ages, epochs, periods, eras, eons, and supereons of the earth better than the geologic time scale linked to earlier; also see the ICS Geologic Time Scale). Did I understand the vast amount of time involved between trilobites and dinosaurs? I don't know. I do know that thinking in terms of geologic time has become somewhat commonplace for me, and it seems to be primarily a matter of numbers and scale, and something that I visualize. 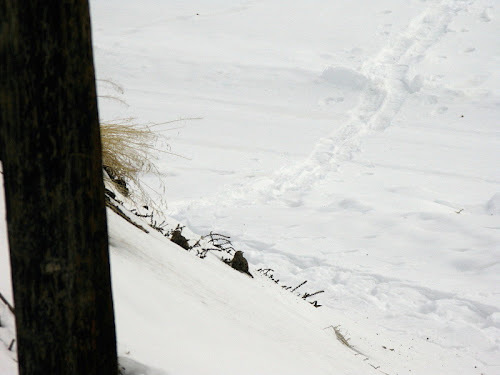 My life fits inside a linear view, which runs from left to right in front of me: my birth being to the left, today being right in front of me, and my imagined latest years, even somewhat beyond likelihood, being to the right. When I think of history going back to the time change from B.C. to A.D., 1 A.D. is on the left, and everything else is relatively squished as it approaches today, which is still right in front of me. So, what about the 2 million years or so of Pleistocene glacial and interglacial intervals? Now, I've placed the beginning of the Pleistocene over to the left, our general time or the last century is right in front of me. At this point, I can't help but look farther left, beyond the beginning of the Pleistocene, where I can easily see the entire Tertiary back to 65 million years ago. If I think of all of geologic time — the time frame during which the Earth existed, the last 4.6 billion years — things get even more squished on the end towards our current time, and I've often at this point managed to seat myself firmly in the early Paleozoic, Cambrian maybe, about 600 million years ago. The Precambrian is off to the left, and everything else off to the right. Sometimes I look at this sliding geologic time scale from the end of the Paleozoic, toward the Mesozoic, knowing (even though the Paleozoic rocks and fossils didn't know) that dinosaurs and the massive intrusions of the Sierra Nevada will be coming along as geologic time progresses. And so, viewing all of geologic time, or particular parts of geologic time, requires me to slide my view to the right and left — or to slide time itself — while expanding or contracting the detail of the time frame, depending on what I want to look at. And when I'm reading about a particular time — whether historic, pre-historic, or geologic — the view often shifts until that the particular time is right in front of me, with time after that, including present time, over to the right. Another thing I find myself doing when trying to view geologic time — and possibly this happens because I've read so many science fiction books set in countless future timelines — is to include future histories and future geologic time frames in my view, way off to the right. I do this when thinking about the future of the Earth, Solar System, and Universe, and also when thinking about things happening on Voyager in the 24th century (Star Trek timeline), or on the planet Path (Ender’s Universe). Often, this future time looks dark, with a lot of scattered stars and star systems. Or, once again, if I'm reading or watching books or movies set in these future timelines, that present is right in front of me, and our current present — their past — is to the left. McPhee meant the term to refer to the immense intervals, measured in millions of years, disccussed as if they were days or weeks in the conversation of geologists: yet in reality, the intervals of geological time are too long to be readily comprehensible to minds used to thinking in terms of days, weeks and years--decades, at most. But apart from telling you that Deep Time is long, conventional accounts never consider the implications of the scale of Deep Time on the way we think about evolution [I extrapolate, here, to include other geological occurrences and events]. If, as McPhee says, Deep Time implies intervals more or less incomprehensible to humans, we are entitled to ask whether it is valid to tell stories about evolution according to the conventions of narrative or drama. If it is not, then every story we tell in which causes are linked with effects, and ancestors are linked with descendants, becomes questionable: we can no longer use Deep Time as a backdrop for the stories we tell ourselves about evolution, and how and why we came to be who we are. Now, as an aside, I'd like to take deep time in literature farther back than John McPhee, to the "deeps of time" of J.R.R. Tokien. Al-Rawi, M.M., and Al-Hassani, Salim, 2002, The Contribution of Ibn Sina (Avicenna) to the development of Earth Sciences: Foundation for Science, Technology and Civilisation, Publication 4039, 12 p.
Avicenna (Ibn Sina), c 1014-1027, The Book of Healing: editions of the Arabic text were published in Cairo, 1952-83, originally under the supervision of I. Madkour (list of works). Gee, Henry, 1999, In Search of Deep Time: Beyond the Fossil Record to a New History of Life: The Free Press, New York, N.Y., 267 p.
Hutton, J., 1788, Theory of the Earth: Transactions of the Royal Society of Edinburgh, vol. I, Part II, pp.209-304, plates I and II. Hutton's work is available online in several places (Univ Wisconsin, 1788 version with link to 1785 abstract, Project Gutenberg, 1795 version) and also for sale at Amazon.com. McPhee, John, 1981, Basin and Range: Farrar; Straus & Giroux, New York. NOTE: You can now, starting today, follow @GeologicTime on Twitter to find out, "What would 4.6 billion years of Earth history look like [when] represented by one year's worth of tweets?" I suspect that @GeologicTime will be quite busy during the latter months of the year! Read a little more about that project here.